In the lead up to the Lone Star State’s annual pageant of food that could never be part of a sustainable human diet, the best tasting and most creative food winners at the Texas State Fair have been announced. With a concessions archive that includes everything from fried chicken in a waffle to deep-fried Dorito pizza, it’s probably easier by now to list the foods that haven’t been deep fried at the fair yet. This year, it was Jell-O’s turn to answer the call. Ruth Hauntz, longtime State Fair concessionaire and adorable little old lady, has taken the Big Tex Choice Award for best-tasting food with fried Jell-O balls. 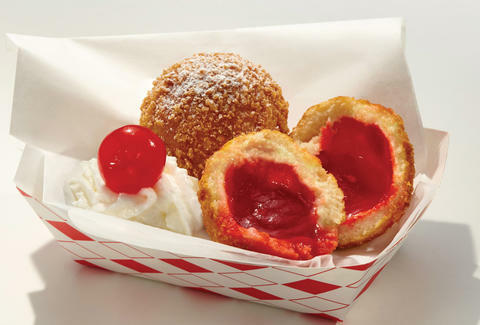 After months of R&D, the well-guarded process involves flash-frying chunks of cherry Jell-O -- that miraculously remain gelatinous -- coated in a panko crust that expands to a beignet-like consistency before being served with powdered sugar, whipped cream, and a maraschino cherry. Most creative dish accolades went to Isaac Rousso for his invention of cookie fries; dough made from sugar cookie batter (not potatoes) with sprinkles formed into the signature crinkle shape and served with a cup of strawberry dipping sauce that mirrors a shade of ketchup. With last year's smoky bacon margarita, Rousso has take back-to-back Big Tex awards. We smell a dynasty forming. Other dishes slated to debut at this year’s Fair include deep-fried Funyuns, chicken pot pie pockets, and brisket balls with an injectable pipette of BBQ sauce. You’ve got from September 30th through October 23rd at Fair Park in Dallas to get in on the gluttony. Sean Cooley is Thrillist's Cities Senior Editor and he is willing to work in a Texas State Fair test kitchen. Follow him: @SeanCoolish.